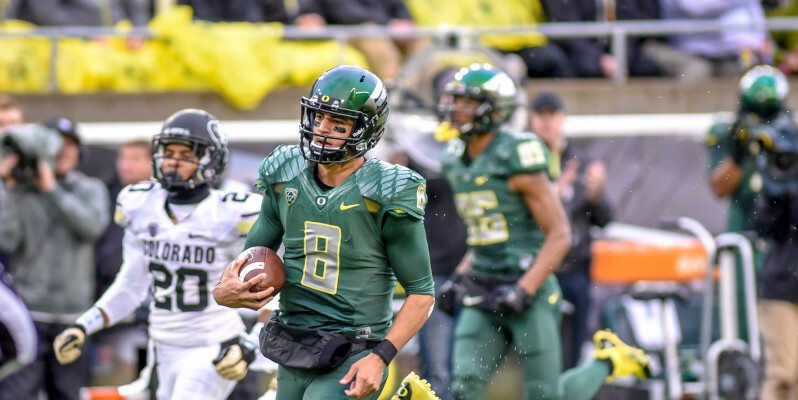 Many in the press are becoming less skeptical of former Oregon quarterback Marcus Mariota‘s successful transition from the Ducks’ high octane spread offense to a more prototypical NFL-type system. In a roundtable discussion on the NFL Network, former New England Patriot and NFL fullback Heath Evans and former Chicago Bears wide receiver Curtis Conway believe Mariota continues to make the necessary adjustments to succeed as a professional based on his performance at the 2015 NFL Scouting Combine. “For a quarterback who hasn’t played under center, when you look at his transition in the combine tapes form under center, his footwork, just the smoothness of the athlete… I’m not a quarterback guru, but I’ve played with two of the best ever, and this kid looks smooth,” Evans said. Evans, a former Super Bowl Champion, played alongside two Super Bowl-winning quarterbacks, Tom Brady and Drew Brees. The former Saints star also remarked that Mariota appears to be improving overall, providing skeptics with real evidence of his relentless work ethic and mental elasticity. “This is one of the small things I’ve pulled away from [Mariota]: You can tell he’s been putting in the work, he’s been grinding, he’s gotten a lot better,” Evans said. Mariota has been training with private quarterback coach Kevin O’Connell, who also worked with former Heisman-winning quarterback Johnny Manziel. Pac-12 Network commentator Conway agreed with Evans, noting that Mariota’s ability to learn Oregon’s offense at a young age is a strong indication towards his ability to overcome the challenges of adapting to the NFL. “Here’s a young man who took an offense, as a redshirt year, mastered it, and stepped on the field. The rest is history. He puts in the work,” Conway said.